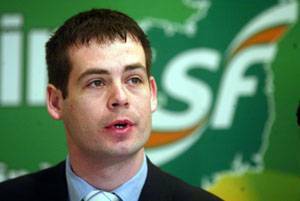 Sinn Féin TD and finance spokesperson Pearse Doherty says that the Government must abandon its property tax plan and reverse the household charge in view of the collapse in property prices. Doherty made his remarks following the release of figures from the CSO, which showed that prices of houses and apartments across the state fell at their fastest annual rate in almost two years last month. He said the tax to begin with would be inequitable, but could not even be considered in light of what people who own property are currently dealing with. Deputy Doherty said: “In the time leading up to and during the housing bubble, caused by government policy, ordinary families were forced to enter into 30 year plus mortgages to avail of massive loans in order to purchase a home. At the time, most of these families paid huge stamp duties and various other fees. “The collapse of the market has seen many of these people end up in negative equity, 100,000 homeowners in mortgage distress and many more unemployed. “To levy a property tax on these people would be grossly unfair. The Government has not mentioned any linking of their proposed tax with ability to pay; the taxes already paid on the property; or even with the value of the property. They appear to be leaning towards square footage value. “Sinn Féin’s wealth tax is a more equitable proposal which links ability to pay with a percentage tax on all property, physical, material and financial, over €1 million. Our wealth tax allows 20% write-off of the value of the principal residence. It is estimated to bring in €800 million in a full year.